It took talented stage actor David Oyelowo (Interstellar, A Most Violent Year), formerly of the Royal Shakespeare Company, over a half-decade to book the lead role of Dr. Martin Luther King Jr. in Selma. Even when Oscar-nominated director Lee Daniels left the project and took the entire cast with him, Oyelowo stayed attached and campaigned for Ava DuVernay (Middle of Nowhere, I Will Follow) to helm the film. The result turned out so well, that it’s difficult to imagine anyone else directing the movie outside of DuVernay. Selma doesn’t follow the typical biographical motion picture standard of choosing a historical figure and following his or her life from start to finish. Instead, the director takes one chapter out of American history and follows the most important figure involved in addition to other factions to give the narrative a dynamic of viewpoints. Like Spielberg’s Lincoln in 2012, the protagonist is an American icon whose character explored in a limited window of time as opposed to the scope of a lifetime. 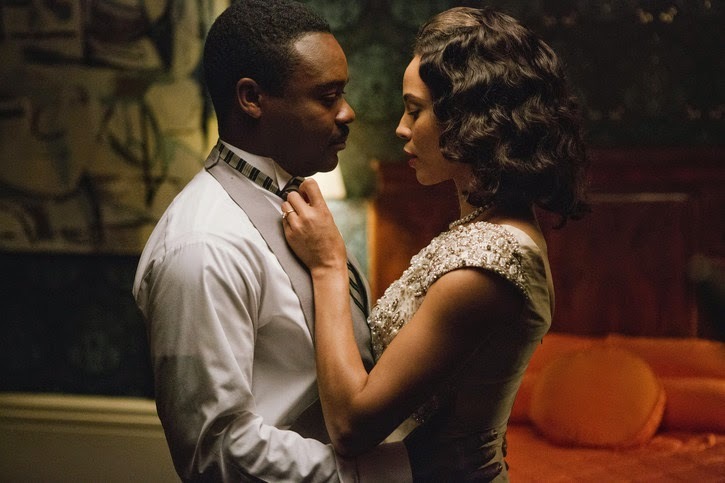 With bold performances and ambitious directing, Selma deservingly finds itself among many awards conversations. Selma follows Oyelowo as Dr. King, preparing for and executing his 1965 non-violent march from Selma to Montgomery, Alabama, in order to secure equal voting rights. The camera also checks in on President Lyndon B. Johnson’s (two-time Oscar-nominee Tom Wilkinson- The Grand Budapest Hotel, The Lone Ranger) interactions with King as well as his reactions to the news in Selma. The audience also gets a piece Governor George Wallace’s (Academy Award-nominee Tim Roth- Grace of Monaco, “Lie to Me”) racist mind as he attempts to violently quell the peaceful march. Most importantly, DuVernay isn’t afraid to point the camera into the violence perpetrated by racist radical police officers, harming non-violent protesters in the name of the law. The lead performance is the film’s highlight. Much like the Oscar-winning performance given by Daniel Day-Lewis in Lincoln, David Oyelowo stands out among a cast of award-worthy performances. He becomes the icon on screen, having a similar delivery of speech and matching King’s mannerisms. What’s most interesting about the performance regarding King is that actor and director explore two aspects of the character never before endeavored on screen: the brilliant strategist and the flawed family man. Watching Oyelowo meticulously plan the march while anticipating his opponent’s moves, public reaction, and subsequent outcry give King a competitive edge never demonstrated on film before Selma. King isn’t portrayed without his flaws as rumors of the activist’s infidelities also briefly come up between King and his wife, Coretta (Carmen Ejogo- The Purge: Anarchy, “Zero Hour”), in a quiet, emotional scene. Ejogo uses what brief screentime the script allows her to create a nuanced character in one scene. She confronts her husband about infidelity and forgives him in an emotionally charged scene where she holds nothing back. If the truth ever finds the press, their growing family—and the entire civil rights movement—will unravel and fall apart. Although Ejogo appears in more than a couple scenes, it’s the scene where Coretta confronts Martin that certainly remains with viewers. Wilkinson’s performance as LBJ leaves little to be desired—he matches the rhythms one would expect a President in the mid-1960s behave. President Johnson seems invested, but not that invested in equal voting rights. He calls King into the Oval Office, asks the activist what he needs, and then blatantly disregards King’s answer with a counter proposal in a smaller ballpark. LBJ isn’t a “villain” in Selma, but one wishes in retrospect that an American president could have aimed for more than “not-a-bad-guy-per sé.” The head of King’s opposition, however, in the film is Roth’s Governor Wallace—a slimy, narrow-minded fool seemingly unaware of the Constitution. DuVernay’s Selma isn’t afraid to look at the horrors of what the brave non-violent protestors endured in order to secure their rights. The film presents an eye-opening experience to just how unbelievably cruel the opposition facing Dr. King physically fought to keep African-American voters from the voting booth. On the other hand, the film also demonstrates the outpouring of love and support the Southern Christian Leadership Conference received from men and women of the cloth when the going got particularly tough to get legislation passed. Featuring a transformative performance from David Oyelowo and a strong supporting cast to back him up, director Ava DuVernay’s Selma is an important film that brings the past to life, sure to become a staple in high school American history class for decades to come.